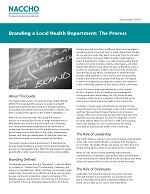 Local health departments can adopt the business practice of branding (also known as image management) to differentiate their role and function within the community from other health-related organizations and providers. This guide introduces brand development. It describes the journey toward building a strong brand and breaks the process into manageable steps.